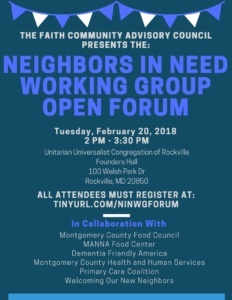 Be among the first to hear about the evening of April 9th where our County Executive will address the benefits of the Interfaith Network of Montgomery County (INMC) and we will demonstrate reasons why more faith communities should get on board. We want to demonstrate the value and synergistic power evident when government, nonprofits and faith communities work collaboratively. On Tuesday, February 20 we will begin preparing for April 9th by hearing progress reports related to healthcare, hunger and welcoming our new neighbors. This will serve as a basis for the launch in April.